Britain’s Home Office has been accused of “spying” on asylum seekers, after it was caught using debit cards to track their whereabouts. Those seeking refugee status are currently given an ‘Aspen’ card, which entitles them to £37.75 a week. They can use it to buy food and clothes. But a recent investigation has found some asylum seekers had been denied the money for attending court hearings or seeing family members because they had gone out of their “authorised” city. 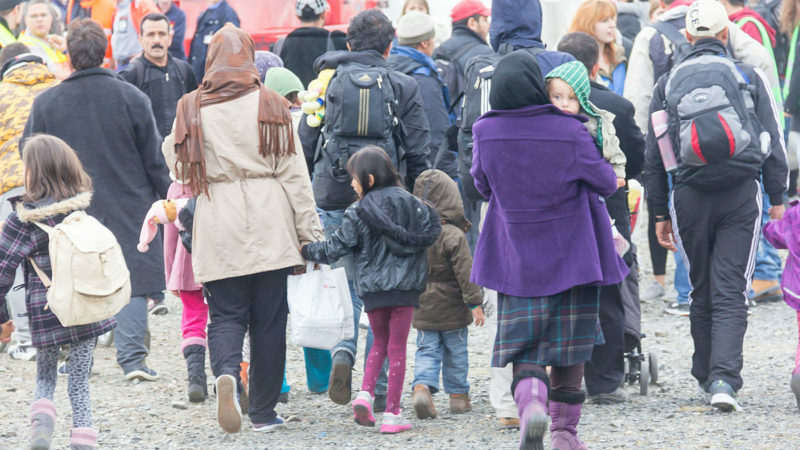 It follows news of “unacceptably high” delays during the processing of asylum applications. Whistle-blowers have previously revealed the system is a “lottery” – with some feeling underpaid, under-resourced and overworked. It’s meant the turnover of staff is huge, with a quarter leaving the department over a six-month period. Some have also revealed their colleagues employed “intimidation tactics” during interviews, while others said they mocked applicants. In its report in 2017, David Bolt, the Independent Chief Inspector of Borders and Immigration, said the Home Office was “not in effective control” of its asylum process and would “struggle” to keep on top of claims. But it appears the system is already struggling, with some asylum seekers having to wait a long time to have their case heard. The number of cases waiting six months or more has trebled since 2010 – up from 4,081 to 14,306 in 2017. Worse still, more than 1,600 children have been waiting a year to have their cases heard. Some of these children will have come without parents and even if their application is successful, they will be unable to bring them to the UK. This questioning of international law is problematic. Javid appears to suggest seeking asylum via an irregular route is illegal, but it’s not. The 1951 Refugee Convention does mention that people may have to come through an irregular route but it says they shouldn’t be penalised for this. It all points to the continuation of the ‘hostile environment’ – introduced by then Home Secretary Theresa May in 2012 as a means of deterring illegal migration. But since then, legal migrants and asylum seekers have been drawn into its web, and accused of being here illegally. Javid’s comments highlights how this is the case. How then does a country with a proud history of accepting people fleeing persecution and war sink to openly berating and criticising them? It’s all because the government is so determined to be seen to be tough on migration. Originally, they had planned to reduce net migration to the ‘tens of thousands’ but last year basically dropped that pledge and instead went with ‘sustainable levels’. Opinion polls show that migration is one of the public’s top concerns. In a recent poll, most Britons surveyed believe immigration levels are too high. On asylum seekers specifically, half of Britons don’t believe that the majority of them are fleeing persecution or war. And because of the mistrust, they already face barriers when they arrive here. They cannot work for the first twelve months of their application. After that, they are restricted to jobs on the Shortage Occupation List. They are not allowed to apply for a Tier 2 Visa. So, when Mr Javid talks of asylum seekers not being ‘genuine’ – he is deliberately stoking fears and adding to the ‘hostile environment’. Does Mr Javid know more than half of asylum claims are rejected? The UK has one of the lowest asylum application rates in Europe and yet still swathes of people are denied a right to be here. Even for those who are successful the picture isn’t great. They are often stuck in poorer areas – with low employment rates and a struggling economy – as opposed to the richer ones. In affluent Windsor, the prime minister’s constituency, there isn’t a single asylum seeker. This is hardly a system of decency, of compassion and care. These are people who have left war torn areas, been persecuted because they are gay or live in fear because of their religion or race. There’s nothing wrong with being put in a poorer area, but the government should use it to improve things. We should be more kind. We should be empathetic. This isn’t the Britain that championed refugees following the Second World War. We should be doing all we can to help, just like we did then. Jack Gevertz is a writer for the Immigration Advice Service; an organisation of UK immigration solicitors which provides legal support for those looking to migrate to the UK or hire overseas workers.